Your golf bag, more specifically. If you’re a serious golfer, there are many important things you need to have in there, no matter what. A lot of golfers get by with their current bags, assuming they don’t need anything else. They’re not always right. There are millions of golfers out there. It’s time you got ahead of the curve. You should think of your bag as your helper, where you keep some of the most important gadgets for your golf game. Here are ten fundamental things to keep in your bag. Experienced golfers know that playing a round can be physically demanding. You walk, you stand, you swing, you walk again. That can go on for hours on end. Most of the time, it happens under the hot sun. That sun is great when you compare it to the winter. But, it can also take a toll on a golfer throughout their playing career. With rising risk of cancer over time exposed to UV rays, it’s more important to stay protected. Using sunscreen won’t take away the warmth of the sun–but it will take away the health risk. Choosing the right sunscreen is important. Once you have the right pick, always keep some handy in your bag so you can re-apply throughout the day. Then you can worry about other weather concerns. Just like an experienced golfer knows the familiar feeling of the sun beating down on them, they know the rain. Who hasn’t experienced it? You’re out for a round with some friends and it’s bright and sunny. Halfway through the afternoon, you’re half an hour from indoors and woosh–in comes the summer rain. You’re left trapped in what feels like a monsoon. The obvious solution is an umbrella. You might be rolling your eyes, thinking “Duh!” But don’t be so confident. Even the pros can’t always predict bad weather. That’s why it’s best to always keep an umbrella in your golf bag. This is a no-brainer for any golf bag. Golf balls are the center piece of the sport. Still, you’d be surprised at how many people forget to replenish their supply of balls. That’s why it’s important to check your stash before every time you hit the range or course. And you should leave some room for balls that are less fresh. The timing of a golf game can be somewhat unpredictable. You might be the most efficient player out there, but the length of your game can still be in flux. With many players and many yards, of course, you might end up with a several-hour expedition. There’s nothing wrong with that, but you will have some free time on your hands. That’s a perfect time to practice your swing or put. That’s why it’s important to have a sizable handful of practice balls in your golf bag. When your turn has passed, you can pull them out and work on your form. It’ll help you improve when there isn’t the pressure of competition. And then you’ll perform better when that pressure is there. Keeping a writing utensil in your golf bag is important for a simple reason: keeping score. If you don’t keep score, you’ll take the round less seriously. That will lead you to take your overall game less seriously. You never want to stress about golfing, but you do want to get better. Having a pencil or marker to keep track of strokes will help you do just that. Plus, it feels pretty good to win. You can earn a nice break after winning a few holes. The physical exertion of golf is subtle. In fact, it’s misunderstood people who’ve never spent hours walking around on a golf course. You need an energy boost while you’re playing. That’s why you need to keep snacks and water in your bag. Pick an energy bar you like. Once you know your favorite, you should always keep one or two in your golf bag. That boost of energy will improve your game, and it’ll also keep your focus on the course, not on a grumbling stomach. A golfer’s gloves are the secret oil that keeps their game running smoothly. With a great pair of gloves, your confidence can improve, along with your stroke. It’s no coincidence that Tiger Woods’ used gloves can sell for hundreds or thousands of dollars. That’s why you need to have a pair of gloves you love. But hold on one second. What if your glove tears? You should be able to reach into your golf bag and grab another. That’s why keeping an extra pair in your golf bag is essential. If you get any kind of injury on the course, it’s important to be ready. You or anyone in your group could sprain an ankle or fall and pull something serious. If you’re properly equipped, you’ll be ready for anything that comes your way. Are you ready to raise the stakes a bit? If you are, you might already be betting small amount with your group. We’re not talking making thousands of dollars on one day. The culture of everyday players often includes betting a few dollars on the day’s match. That’s why you should keep some cash in your golf bag. Hopefully, you’ll only add to it. As golf technology evolves, it’s important for you to stay up to date. Keeping up with current technology in golf is essential. Using a GPS on the course is one of the perks of golfing in 2017. Find the right GPS for you and keep it in your bag. It’ll help you navigate the terrain that you can’t see with your own eyes. With the right things in your golf bag, you’ll be more ready than ever before to head out to the range and have a great day golfing. Interested in more info on improving your game? Feel free to reach out to our team with questions. And then get out on the course. Good luck! 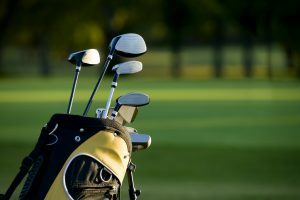 ‹ What are the Best Golf Club Brands?